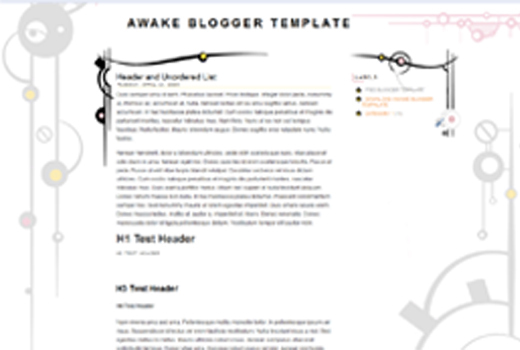 Awake template for free download on Blogger Templates. it’s a nice Temlpates thr .. i really like it very much .. Your template could not be parsed as it is not well-formed. Please make sure all XML elements are closed properly. XML error message: The element type “A” must be terminated by the matching end-tag “”. hope admin will help me to fix the problem soon . =)) ..
Did you upload the whole template file or did you copy paste the codes into your blog? i uploaded the whole template file ..
err . is thr any wrong steps that i’ve made ?? If you scroll to the bottom of the html source you should be able to find the below shown snippet, where the anchor tag after ” /a © 2009.” is defined using an uppercase A. Just edit it to a lower case ‘a’ and save. This should fix the problem. can i know what should i do after i download the template? Are you for real? Damn, yes you are, this should be required reading. with your permission, I will make that happen. Thanks for the publish. My partner and i have constantly observed that the majority of people are wanting to lose weight simply because wish to show up slim plus attractive. Nonetheless, they do not continually realize that there are additional benefits for losing weight also. Doctors assert that fat people are afflicted by a variety of diseases that can be directly attributed to the excess weight. The good thing is that people who sadly are overweight and suffering from several diseases can help to eliminate the severity of the illnesses by simply losing weight. You’ll be able to see a steady but marked improvement with health whenever even a negligible amount of weight-loss is obtained gywl59. One thing I’d like to reply to is that weightloss program fast can be carried out by the proper diet and exercise. People’s size not only affects the look, but also the general quality of life. Self-esteem, melancholy, health risks, and also physical skills are impacted in extra weight. It is possible to make everything right but still gain. Should this happen, a medical problem may be the offender. While excessive food instead of enough body exercise are usually at fault, common medical ailments and traditionally used prescriptions can greatly add to size. Thanks alot : ) for your post here gywl512. I want I had these kinds of excellent insight on that subject. Thanks for informative post! It definitely helped me in understanding this confusing issue better.